Elmore Jenks’ diary ends here. After the Buna campaign he returned to Australia, apparently for the duration of the war. I don’t know why he and his comrades were sent back to Australia. Perhaps it was to contribute to Australia’s defense against a potential Japanese invasion, or to train for the anticipated final invasion of the Japanese mainland. But Dad doesn’t say and he may not have known the reason. It goes without saying, of course, that General Eichelburger’s promise to send the Buna veterans to Hawaii for rest and recuperation was never fulfilled. That would have been a nice development, though, because Elmore could have been reunited with his brother, Army Captain Stanton F. Jenks, who was stationed at Pearl Harbor. Happily, both brothers returned safely home after the war, and both became high school teachers. Elmore’s diary is obviously a gold mine of facts and memories. He writes plainly and has a nice eye for detail. But it also leaves out a lot of information that would have been nice to have. 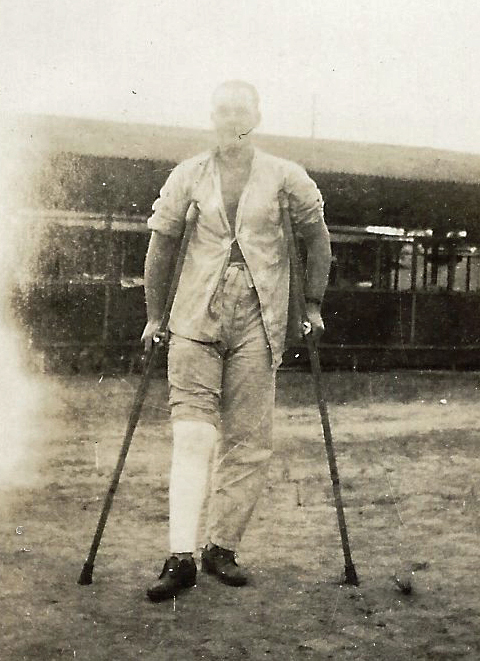 Among the photographs in Dad’s scrap book is a picture of him on crutches. The diary records Dad’s experience with malaria and its causes (“The mosquitos came over us like a blanket”), but he never mentions the crutches. When Elmore and Mary’s children were growing up, he often mentioned his “bad knee,” which still bothered him at times. Thinking the knee might be a battle injury, I often asked him how it happened. At various times he’d offer different explanations. It was an obstacle course injury during training. It happened when he caught his foot in the webbing of a ship while jumping into a landing craft. Both could be true. But later in Dad’s life, when I was reading his war diary aloud so he could comment about it, I asked him again: How did you hurt your knee? They don’t give out purple hearts for that kind of injury, but the story rings true. In fact, most of the diary rings true. He is quite candid about the criticisms he received from superior officers as well as the contempt he felt for many of them. His inability to rise above the rank of second lieutenant bothered him, but he faced it squarely in his diary. The diary does leave out small details my siblings and I have always wondered about. One of his war souvenirs is a pair of chop stocks in a wooden holder. It seems likely the utensils were removed from one of the numerous bodies of Japanese soldiers that lay in the jungle or floated in the surf near Buna Mission. Did Dad remove the chop sticks from a man he had shot, or was the acquisition less personal? The chop sticks now lie unceremoniously in my sock drawer, but I wonder about their story every time I see them. Pasted in Dad’s scrap books are yellow, postage-stamp-sized pictures of Papuans in their villages in Eastern New Guinea. The pictures were so small and yellow that I barely noticed them growing up. When I scanned and enlarged them recently, I discovered they were amazingly detailed images of a now fading culture. 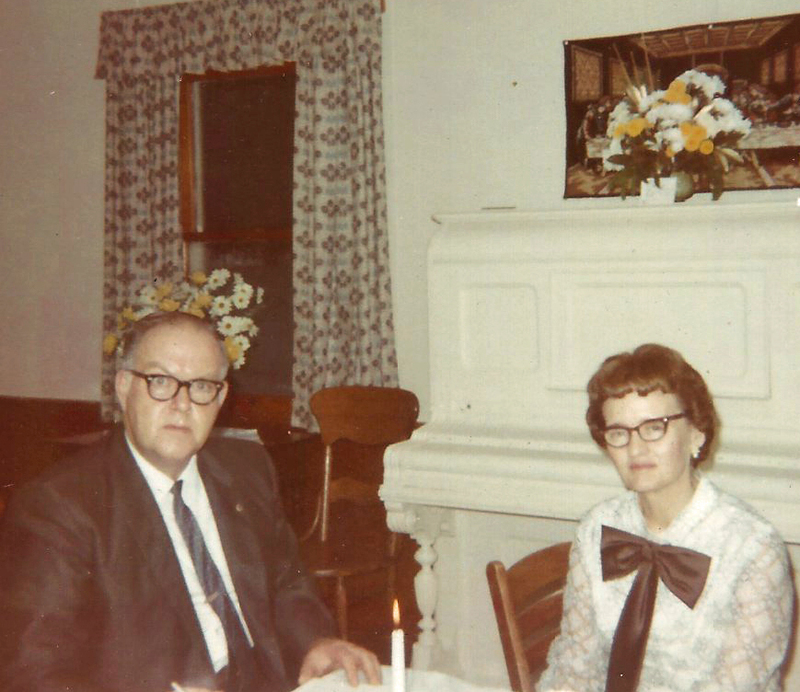 I assume Dad took these pictures, but I don’t know how or with what kind of camera. Perhaps the officers took pictures of each other and traded prints when they were ready. 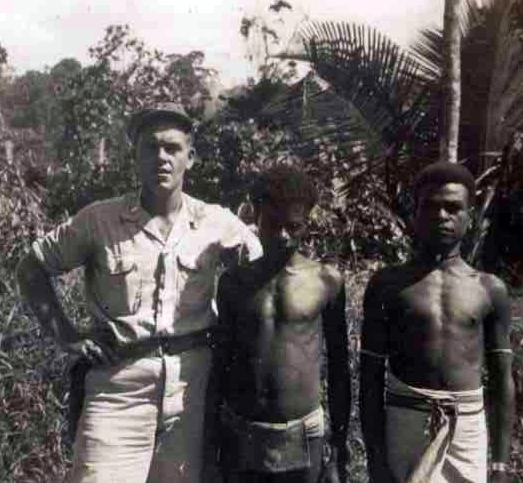 Papuans posed willingly with the officers, and the Americans struck poses like benevolent liberators, their hands on their hips where they could easily grab their sidearms, holstered ostentatiously as a warning to evil doers (such as the officers of the Japanese Imperial Army). The diary is wonderfully anecdotal but it leaves out a lot of the details of Dad’s army career. 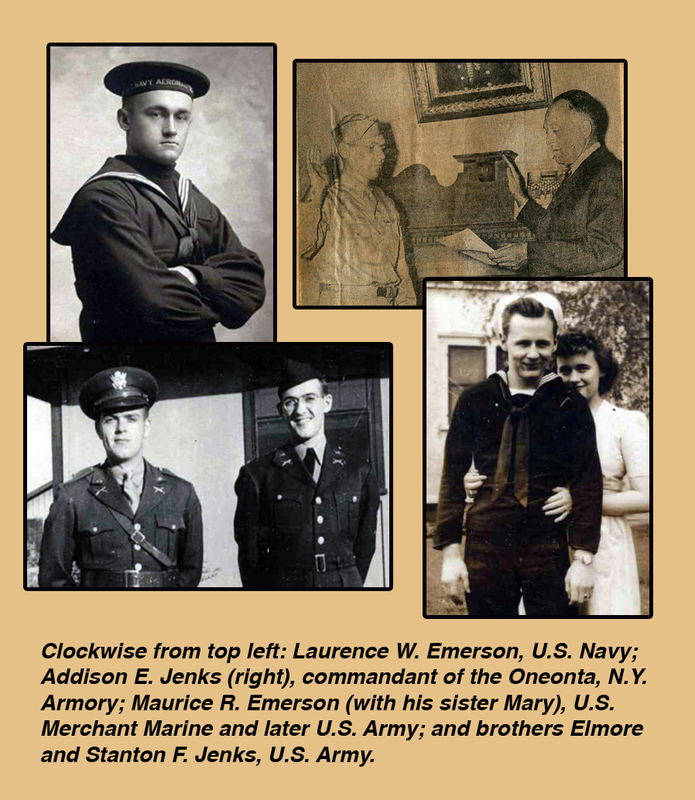 I know he and his brother Stan were commissioned as officers when the war began in 1941 because they had spent summers in an officer candidate camp near Oneonta. This in itself is notable given the strong isolationist attitude of most Americans in 1939 and 1940, and President Roosevelt’s promise that “your boys will not be sent into foreign wars.” (“If we are attacked,” FDR whispered to aides, “it’s not a foreign war.”) Even so, Elmore and Stan probably didn’t think war was inevitable. I suspect they were encouraged to prepare for commissions by their father, Addison Jenks, who was superintendent of the Oneonta Armory. The details of why Elmore was assigned to certain units, and when he was finally promoted to first lieutenant, and when he was finally released from military service, are all uncertain. (I always assumed I was born precisely nine months after Dad returned to Oneonta, but my math is speculative.) All that information is in his 201 file, which was destroyed along with millions of other paper military records in a government warehouse fire years ago. I am sure I have seen a fuzzy thermofax of his military record somewhere, but I have no idea where. Unless the record miraculously reappears among my own papers, or in my sock drawer, the details may be lost. All of which makes Dad’s diary even more valuable. 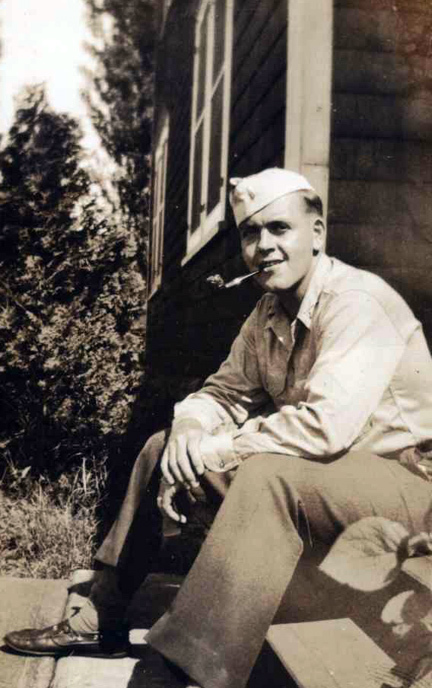 The details he provides, especially his description of horrifying nights in the Buna campaign of December 1942 and January 1943, shed a clarifying light on his personality and, especially, his life-long attitudes about war and peace. Reading his diary after 70 years, I clearly understand why he hated it so much when my brothers and I played war: a topic I have returned to several times in blogs and sermons. Buna Diary was first posted on a family Facebook page so Elmore’s sons and daughter can read it, and so it will be available to nieces, nephews, and grandchildren who were young when Elmore died, or didn’t know him at all. I hope it will be a helpful family resource for all of them. Elmore Jenks died April 16, 1999. After the war he finished his bachelor’s degree at Hartwick College in Oneonta and worked as a business teacher at Morrisville-Eaton Central School, Morrisville, N.Y., from 1946 to 1976. Mary Emerson Jenks died in May 1983. From 27 December to 1 January, things were about the same. We dug in along the trail up through the jungle and our job was to keep the trail open at all costs. It was a supply trail for the big push on to the Mission. Our job was also to go out to the sea to cut the Japs off and put them in a pocket. They were cut off both to the north and south of the Mission on a front of about three miles, and we were going to split that pocket and cut them in two groups. We did, without too great a loss. My platoon was at the rear of our company along the trail, and we didn’t see as much action, although what we did see was plenty. I had an MG squad up at the front all the time, and some of my men were used to keep our lines filled up. We were on each side of the swamp and couldn’t dig more than six inches without hitting water. 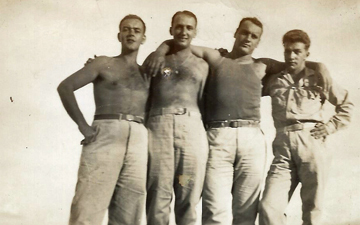 Some of the men dug fox holes and slept in the water. Those of us who didn’t dig, but tried to build up a little protection, were usually soaked by the rain at night. The trail was a mire of mud and the water was hip deep and it rained every night and the heat was awful. We made several drives toward the Mission, but we couldn’t make it. Captain Lewis was hit on January 1st. Lieutenant Johnson took over the company. The Mission fell about 5 January, I think. Dates didn’t mean much then. Major Schroeder was fatally wounded during the drive. After the Mission fell I picked up a rusty tommy gun that worked and gave away my M1 (rifle). The tommy saved my life that very night. 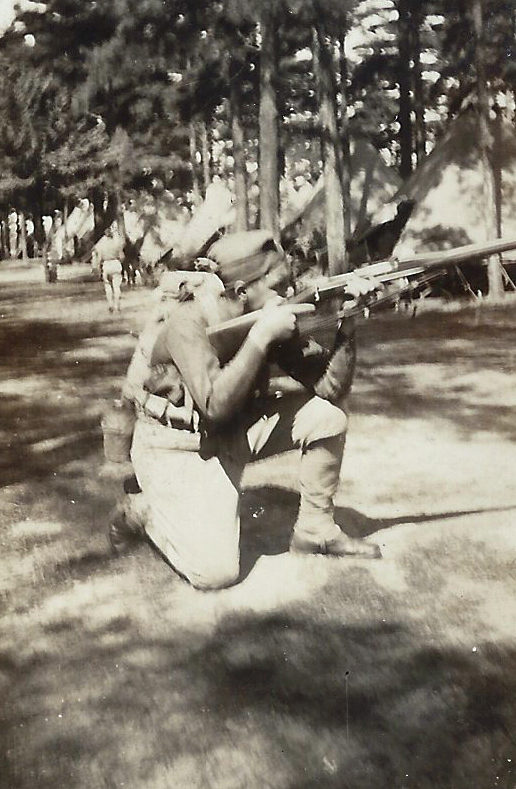 A lot of Japs had tried to sneak through our lines at night, as they had on several nights. We killed 12 of them in the company one night, and two of them were mine. They were only about six feet away when I saw them and they were very quiet. A couple bursts from the machine gun fixed them, though. I took a couple of patrols out and was ambushed twice, but we managed to get out without anyone getting hurt. It was close, though. We were on reconnaissance and we didn’t have to fight, except to fight our way out. The night the tommy gun saved my life – or at the time I thought it did – is one I’ll never forget. The Mission had fallen and we had moved out into the coconut grove to set up a defense along the beach. The company spread out about 500 yards and my platoon was on the right flank. We dug fox holes or slit trenches for two or three men, ate out supper of C rations and prepared for the night. My runner and I were sitting in a trench facing each other. It was near a tree. One end of the trench was not more than three feet from the tree trunk on (the runner’s) end, and his back was up against the tree. About 9:30 p.m., I think, the runner was going to try to get some sleep and I asked him about what time he thought the Japs would try to come through our lines. He said, most any time, and he lay back to sleep. I took the safety off my gun and held it on my knees, ready for what might come. I saw two men, small, not clothed, moving towards us from the right. They couldn’t have been more than 15 or 20 feet away when I first saw them, and they moved in a stooped, crouched walk, coming very quietly, almost catlike. I raised my gun. Apparently they didn’t see me and they walked between us and the tree. One of the Japs fell to the ground without a sound, and the other took off straight away from me. I didn’t dare fire again because there were other (U.S.) men around, and I couldn’t throw a grenade for the same reason. I wasn’t sure in the dark just where our men had placed their holes. About a half hour later I saw the second Jap coming back from the same direction he had left in. He was trying to keep low, and when he was about 10 feet away I opened up again with the tommy gun and he hit the ground. Now both (Japanese soldiers) were lying so close I could have reached out and touched them without leaving the hole. The second one lay there moaning and groaning for about a half an hour before he died. Each time I had seen them I felt the need to kill them before they tried to kill me. But after I fired each time, I just sat there and shivered and shook and trembled for about 15 minutes. I had never been so scared in my life. I couldn’t sleep any more that night, and I would’t let the runner sleep, either. I was so scared. In the morning at first light, we could see them lying close to the hole. They both wore bandages, probably from previous wounds. They wore only breech cloths and had rubber soled, two-toed shoes. They were both thin, under-fed, and both had gold teeth, which the men soon went about removing. The one I shot first had five holes in him from his right hip, diagonally up across his chest. I don’t remember where the second one was hit, but I do remember wishing he would hurry up and die that night. There were twelve (Japanese) killed during the night. Our only casualty was a man who was cut across the shoulders with a saber. Apparently a (Japanese soldier) attempted to decapitate him. The gash is about two-inches deep, but isn’t too serious. The Japs were trying to get through out lines to go to Sananda, and they were being pushed from Cape Endiedairre by an Australian force. That day we dug bigger holes and doubled up a little more. The next three nights we spend with the company pulled close together. Then we pulled out towards Sananda. A few days later, some dumb Lieutenant S-2 reported seven Jap barges a little father up the river. They were supposed to be in perfect shape, and I had to take ten men and put an outpost on them so they wouldn’t be taken away. It was late when we got the orders, and only an hour before dark when we got there. The barges turned out to be landing craft, shot full of holes, sunk, and the motors had been tampered with. But we had no choice but to stay there anyway. It rained like hell that night. The next days I sent out patrols and all we found were dead Japs. Colonels Howe and Boerem came up that day, but I didn’t know who they were. I made a reference to how some damn fool had put out orders to guard sunken landing craft. I found out later that Colonel Howe was the one who put those orders out and he and I haven’t gotten along since. I attribute my still being a second lieutenant to that incident. I was on that outpost three days, and the men were there about four days longer. We had advanced toward the south to pin the Japs between us and the Aussies, who were coming toward us. There Aussies took Jaropi Point about a half mile south of the Mission. It was a bloody battle with a lot of losses. Our company went out to the beach and set up beach defenses for a few days. There were a lot of dead Japs on the beach, and a few Yanks. I was used to seeing dead men, but the stench made me nearly sick. We had to bury them all. We burned up everything we could find and blew up the (Japanese) dugouts. The Japs washed up by the tide were bloated two and three times their normal size. It was terrible. After a couple of days we had the beach all cleaned up and we went swimming in the ocean. We were as dirty as hell, and we just forgot that there were 50 stinking Japs in the water only a couple days earlier. After a few days we went up to Terekena and Sirori villages, toward Sananda Point. The Battalion was stopped on the Garua River and it took several days of bitter fighting to get across. 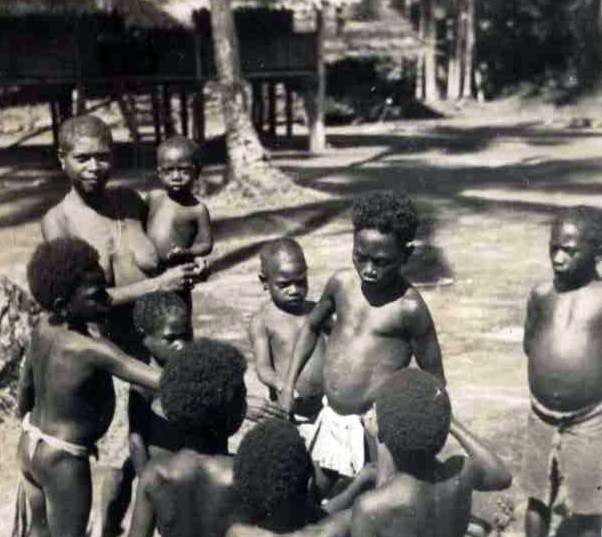 Papuan Family, photographed by Elmore Jenks, December 1942. One of the native huts had been fixed up with barbed wire as an enclosure for Jap prisoners, but they didn’t have any yet. There were some native men there who helped unload supplies from the planes, but their women had been sent to the hills because of the Japs, who used them as their own. The natives killed quite a few Japs with their bush knives. They would trick them by offering to take them to a woman for some pompom. It didn’t take us long to realize the natives hated the Japs intensely. After eating and resting, we started on our way. We were told which trails to follow, and after several tries we got on the right one. After about two hours – or perhaps it was a little longer than that – we arrived at the village of Senemi. Along the way we saw jeeps and trailers carrying out our wounded. They weren’t a pleasant sight. Often, the bandages were bloody and dirty and covered with flies, and the men would be sweating from the heat and the pain. 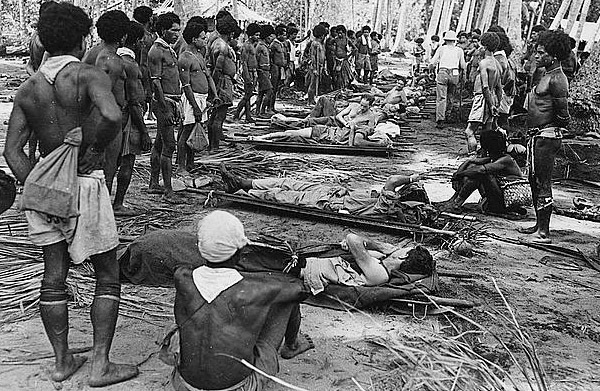 The natives carried the wounded in on litters made of poles and coconut fronds. There were four natives to a litter, four more as relief, and one boss boy. It took nine to evacuate one (wounded soldier), but they made long hikes and never stopped until they were finished. It was interesting to see the crews change as they walked along, or to see the same crew change from front bearers to rear bearers. If the soldier wanted a drink or smoke, they would stop a minute and light a cigarette and give him a drink. Sometimes the native would disappear into the jungle and come back with some fruit or something else to eat. The value of those natives to us can never be underestimated. We waited at Senemi. The other three platoons, which had landed further back, finally caught up with us. As we entered the village, we met General Eichelburger and he said that we were needed badly, that Buna Mission would fall in a matter of hours. We were heartened by the news. We ate at the village and then got rid of everything but a skeleton pack, arms, ammo, and some good. I assembled the company and we started for Buna, following the directions I had received over the phone from the regimental adjutant. We started out on a log road and it was soon dark. Soon our guide thought he had gone far enough, and he went back. The noises of the jungle were new to us, and the road soon gave way to a wet, muddy trail. It was slow going with our heavy load, and we kept slipping and falling in the mud and slime. Lieutenant Bralick and Lieutenant Yepson and a few more men soon caught up with us. They were able to travel faster. It was a helluva night but we kept on, not knowing what might be ahead. The moon was out and the road beneath our feet got better. But we were all dog tired and soaking wet. Suddenly we stopped again and one of the men came back and told me the regimental commanding officer, Colonel Schmidt, was up ahead. I went on up to see him and he told me to pull the men off at the side of the road and rest and try to get some sleep. We hadn’t reached our destination but he said if we had continued on we would have walked into the Triangle, which was a strongly fortified Japanese position and already responsible for a lot of deaths fro our ranks. We hadn’t been told that there was a trail to get around that split. We laid down along the trail for some much needed rest. I shudder to think what would have happened had we walked into the Triangle. On the morning of 26 December, we found the right trail and continued on, meeting Lieutenant Lewis just outside of Buna Village at about 10 a.m. Ge took us past the cemetery to another patch of jungle. 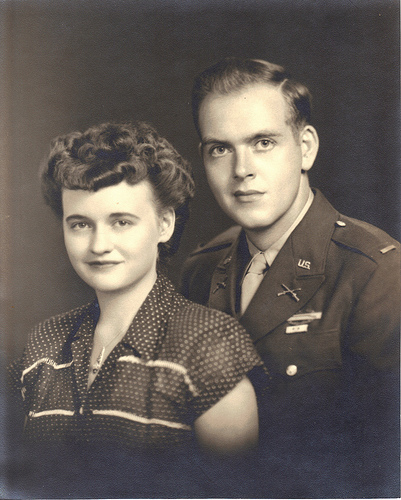 Lieutenant Lewis said that C and F Companies had been cut off by the Japs for two-and-a-half days. They had been badly shot up and were without food and ammunition and they couldn’t evacuate their wounded. We were going in to take them what they needed and get their wounded out. We rested and ate dinner. While we rested, there was a dog fight overhead, but we had to stay hidden so I missed most of it. We moved out about 1 a.m., past the cemetery again. 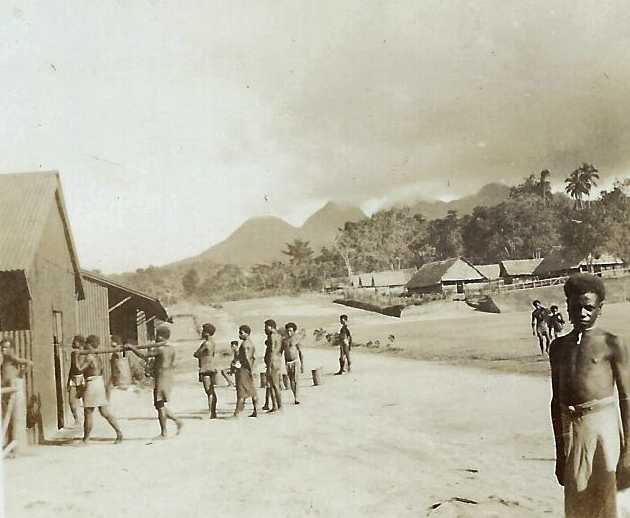 Soldiers in Buna-Gona campaign. Art from Home of Heroes website. We went about 300 yards and dropped everything but our packs, ammo, entrenching tools, and guns. We left the MG’s [machine guns] and mortars. Our artillery shells were coming in overhead and, not knowing whose shells they were at first, I dove for the nearest hole when the first one came by. Lewis was excited and the men were nervous, and it took us a little too long to get organized. We ran through a village which was exposed to MG fire and went into the jungle again. We came to a river and had to wait there. Several men had been hit trying to get across in boats. We had located the sniper who was firing there, but the men were still under fire and a few were wounded as they tried to put the bridge in. About 3 p.m., we started across the bridge, went a little further, and stopped again. I learned that there was an open field ahead that had to be crawled across. It was under fire and the sun was terribly hot. We inched along, and about 5 p.m. I found myself on a tree island in the middle of the river waiting to go on. It grew dark and still we didn’t move. Finally I got impatient – I was bringing up the rear of the company – so I waded on ahead to the other shore to see what was causing the delay. I got out on the path to start across the field and found a man who had lost contact with the man ahead of him. He had laid there for about an hour, not knowing what to do. I cussed him out and gave him hell, and told him to follow me. We started to crawl along the trail. L and D companies had dug in along the trail for about half the way. I got to the other edge of the field and found Bralick and Yepson and we had a conference. They at once decided I should take command of what was left of the company. Lewis and 23 men (I didn’t know how many ay the time) had gone ahead, but I didn’t know where. I crawled back and found a phone and in an L Company hole. I called battalion and asked for advice. I got it. I was told to follow the wire through the jungle trail and contact Lewis. I crawled back and Bralick and I started out to see if we could find them. Just after leaving the field we walked smack into a water-mud hole that was hip deep. Some fun! The wire branched off into two trails. I didn’t know which to follow, and things looked very bad so we decided to spend the night there. I went back to the company and told them to dig in along the trail so we could spent the night there. As I was crawling along the trail to tell the men, a Jap machine gun opened up and they began shelling the field. The shells went off over out heads, and each one sounded about 25 yards ahead of me. I couldn’t find a spot low enough to get into. Finally, I had told all the men to dig in, so I crawled back to the hole my three runners had dug for us. I crawled in. We were so sleepy we couldn’t keep awake, so – no guards. In the morning, Bralick started out and we followed. Soon we met Lewis coming back for us. The Japs had found them and had given them hell with grenades, but there had been no casualties. One of our men was killed by another of our men in there – he had crawled out of his hole and didn’t give the pass word and was shot. The man shooting didn’t know who he was an shot him for a Jap. Such is war. We went on up the trail for about 100 yards. It was just a mud hole – at least knee deep the whole way. Lewis had found C Company with his 22 men. Later, Major Schroeder, the battalion commanding officer, got the Silver Star for making the contact. We stopped and were told to pass up all our ammo and food, so we did. The wounded began coming out and they were a horrible mess. Later, more ammo and rations were brought up and we passed it along. Finally, we stopped passing it along and kept the rest for ourselves. 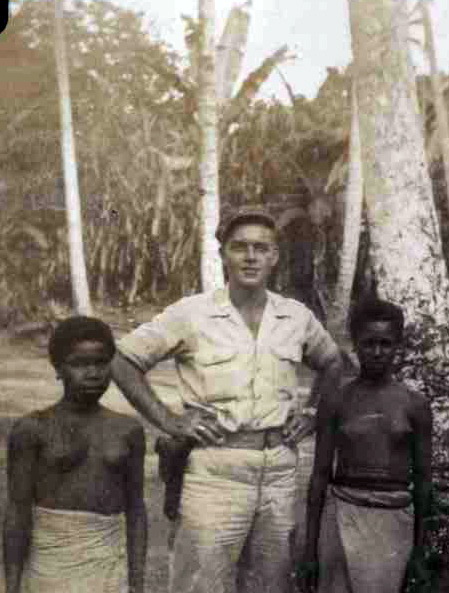 At this point, on 12 October 1943, Elmore Jenks begins to record his memories of fighting in New Guinea, which took place a year earlier. 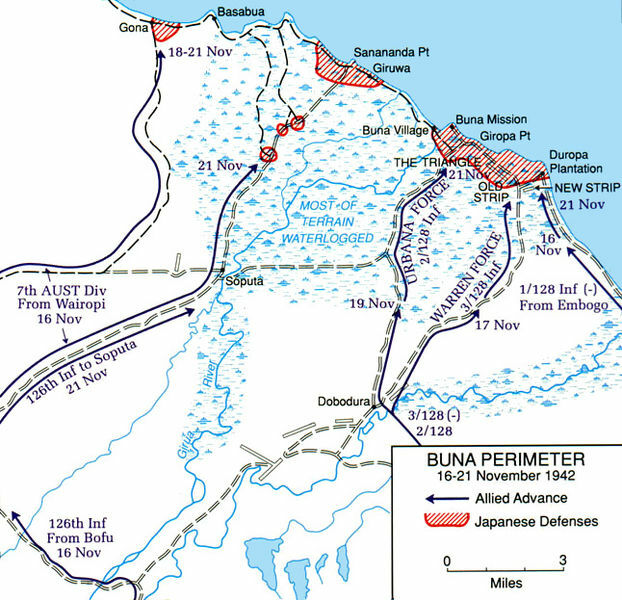 The battle of Buna-Gona, 16 November 1942 to 22 January 1943, was a U.S. and Australian campaign to force the Japanese out of strategically indispensible New Guinea. While not privy to high level strategic planning, Elmore clearly senses what historians have confirmed: that poor intelligence led Allied Supreme Commander Douglas MacArthur and Lieutenant General Robert L. Eichelberger to underestimate the strength of the Japanese occupation forces. 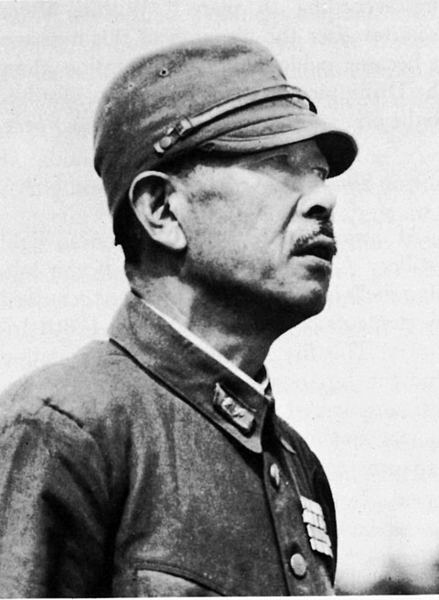 When the allies attacked on three fronts, they were effectively blocked by Japanese defenses commanded by Lt. General Hatazō Adachi. 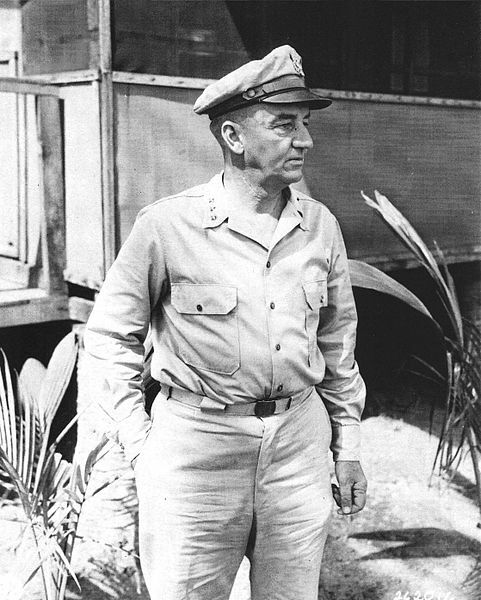 Prodded by MacArthur to take personal command of the campaign, General Eichelberger belatedly realized the difficulty of wresting the island from Japanese forces. 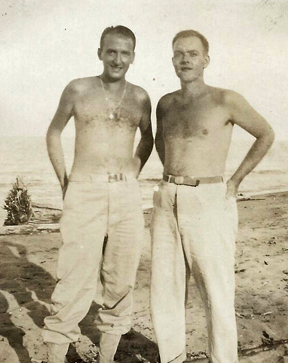 The majority of U.S. troops, including Elmore Jenks, had malaria and other tropical illnesses, and were struggling to advance without the support of requested tanks and artillery. When this support was finally provided, the allies captured Buna on 2 January. General Eichelberger compared the casualty rate to the stunning ratios of U.S. Civil War battles. The number of casualties, killed and wounded, at Buna, exceeded the Battle of Guadacanal by a margin of three to one. I got an inspiration tonight and I thought I’d add to this. I think if I ever try to disseminate the information herein, I’ll sure have a new job. Rather than putting everything in chronological order, I’ve written everything as I think of it or remember it. I was thinking tonight of New Guinea. We sailed from Brisbane on 15 November 1942. That was nearly a year ago, after we had been alerted several times for dry runs – tore everything up, issued supplies, packet up, slept in pup tents – and then didn’t go. But we knew we’d be going soon because the 126th had already flown on up. The regiment left from Camp Cable and went to Brisbane in a convoy of over 100 trucks. It was quite a trip, and we went straight to the ship. We sailed on a little tramp steamer, a relic of the China seas and rivers in the days of piracy. We sailed under the Australian flag, with a British captain and a Chinese crew. The trip was quite uneventful. It was quiet and calm. George Bralick and I shared a small two-feet by four-feet cabin. Actually, it was about six-feet by eight-feet, with a small sink and water stand. The entire battalion was on the boat and it was rather crowded. The officers ate in the ward room, which was small but had tables. The food was poor. We stopped in Townsville and the ship stayed in the harbor for a couple of days. No one went ashore except a chosen few to purchase rations. We did calisthenics and muster every day on board. One day we had a gratuitous issue of PX supplies. We arrived in Port Moresby on Thanksgiving Day (1942) and transferred to an Australian Corvette in the harbor, which took us to the dock. We were in full gear and battle dress. From the rte, we loaded into trucks and were hauled to our bivouac area out about 12 miles from Moresby. The town looked pretty badly bombed and all the civilians had been cleared out. Our bivouac area was out past Ward and Seven Mile Dromes, in a rather flat area not far from the beach. For lunch, we had a sandwich made with some kind of ground eat from a can. It was nearly dark by the time we were settled and fed in our area and got our pup tents pitched. At night, it was pitch black. It started to rain, and it was the hardest rain I had seen yet. My tent fell down in the middle of it, mosquito bar and all. I just pulled the sleeping bag over me and tried to sleep, but I had to get out and straighten the tent up. I got soaked in the process. The rain lasted about two hours. After that, the moon came out from under the clouds. With the moon came the Jap bombers, three of them. They were dropping bombs on one of the nearby air strips. They weren’t coming very close to us, but we didn’t know that at the time. Out anti-aircraft fire was going up and shrapnel fell all around us. Finally, the planes were picked up by our search lights – there were three of the high up in close formation. We should have been safely sitting in our fox holes, but it was a pretty sight and we stood watching them, hoping to see a hit. It was an interesting sight, and just before the lights went out it seemed one of the planes was hit. We couldn’t be sure. After that I went back to a damp bed on the hard ground, and hundreds of mosquitoes swarmed around me looking for a meal. My first night in New Guinea was not the most pleasant. The next day, things looked better. We had a few more raids over the next few days but nothing dropped very close. The days were exceedingly hot, and often we went swimming in the nearby ocean, sometimes twice a day. The swimming area was enclosed by barbed wire to protect us from the sharks, and often the water was uncomfortably hot. We noticed many barbed wire defenses along the shore, placed there to protect us against an expected invasion. We often had some hard rain showers at night, and occasionally during the daytime as well. We could get a Jeep every day to run around in, draw supplies, etc., and I did a lot of the driving myself. After we had been there three or four days, we started taking morning hikes. At first we hiked a half hour out and a half hour back, but later we extended that to two hours each way. We took all our equipment with us, and that was a job, but I guess we got used to it all right. Even so, there was always someone who couldn’t make it all the way. During the third week we fired on a make-shift range, using all our weapons except the mortars. The Third Battalion started moving out the second week, bit by bit. They would load up in trucks in the morning with all their equipment, and in the afternoon some or all of them would come back again, depending on how many planes and if they were able to get over the hump. 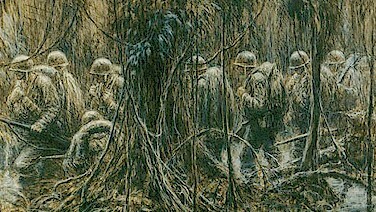 Bad weather held us up much of the time, and some days they were not able to make any trips at all No unit ever got over completely at one time, and as a result, part of a company or platoon might be fighting at Buna and the rest of them would be waiting at Morebsy. Some units made five or six dry runs and it was sometimes a week before a company was all together on the other side. The Third Battalion was followed by the Second, and finally by the First. Dry run after dry run. Our chow was fair – sometimes good, sometimes bad. We had an enormous amount of tea, and took salt pills and also five grains of quinine. Most of us went around with practically nothing on for the first three weeks. I spent most of my time in a pair of cut-off pants and tennis shoes. Finally, though, we were made to wear shirts and pants all the time. At night, the mosquitoes were terrible. They came over us like a blanket. Around 20 December 1942, the pyramidal tents were taken down and the company moved closer together. The First Battalion was the only one left. We saw a movie once or twice a week, and often we had to hold it up for an air raid or alert. The rest of the day, after the morning hike, I spent swimming, reading, writing, ort censoring mail. On 23 December 1942, the trucks came for us. The day before we had an inspection by the battalion commanding officer and were told how we were to roll our packs, board the plane, etc. We got the impression that we were to step off the plane in front of the commanding general and everyone had to look just alike and immaculate. That day Captain Lewis and five men from Company Headquarters got off and the rest of us came back – not so far this time, but to a new area. We had another dry run on 24 December 1942 and we saw another movie that night in the rain. Every evening the Fortresses and Liberators (aircraft) would take off for their nightly missions. They took off right over us and we would count them going out. We’d count them again when they came back around 9 or 10 p.m., and not all of the would come back. During the day there would always be some P38’s, P39’s, P40’s, A20’s and other smaller planes about. We saw one fortress crash into the water about a mile off shore one afternoon. For some reason, it couldn’t get far enough into the air. On Christmas Day 1942, we went to the Drome again and loaded up. 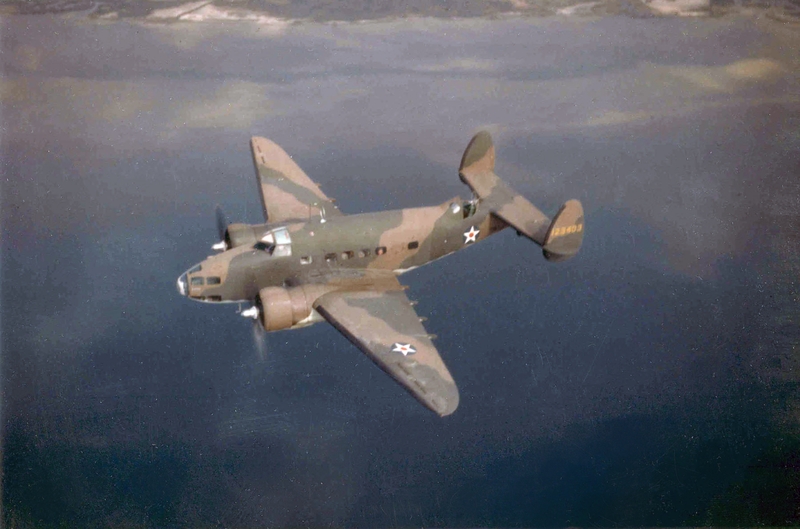 There were C47’s and Lockheed two-engine light bombers. Major Schroeder, Lieutenant Hughes, their orderlies, myself, and four men from my weapons platoon loaded on one of the Lockheeds. We taxied down the runway and hooked a wing on the way up, but there was no damage done. We took off just in time to miss a plane coming in. It was my first plane ride, and what a feeling it was. Our pilot was a young Aussie lad, and he had one Aussie gunner in a top turret mounting twin light .30 caliber guns. The ground quickly faded from normal sight, and we were soon climbing fast, straight for the gap. The ground sure looks different from the air. We started over the Owen Stanleys, headed for what we didn’t know. It was cold up there and we went through the gap with feet to spare on each side and underneath. We were in the air at last; I think it was about 9:30 a.m. We didn’t know whether we would get over the gap or not. The weather reports were good, but the storms gather so quickly in the mountains that the route might become impossible at any time. We climbed and climbed to get through the gap, and the air was chilly. Finally we made it. The trees on either side looked only a few yards away, and the tree tops beneath looked closer than that. After we finally made it over the gap, we came down just over the trees and the pilot opened up and we sped toward the coast. We didn’t take any chances on there being any Jap planes flying about. There was another plane about a quarter of a mile behind us, and another about the same distance behind that. As the terrain became more level, we could see strips of jungle along the streams below, and open fields of junai grass. We couldn’t actually see the streams, except for the ones that were coming through the mountain, which were fresh, cold, and clear. Finally, as we neared the landing strip, they told us to move toward the front of the plane. I had already counted three strips that we had passed – we were to be taken as far as possible toward the front because of all the heavy weapons we had to carry. The rifle platoons landed about 10 miles further back at Popendetta. Finally we banked steeply – I looked out the right window and felt I could reach out and touch the grass, and from the left window I could see the clouds in the bright blue sky – and came in for a rather smooth landing on one of the Dobadurra strips. The strips were simply runways cut into the grass. We hurriedly put our equipment on and unloaded from the airplane. We were told to get off the field in a hurry as there might be Jap planes over head, looking for a good strafing target. The strip was about 50 yards wide and it was made from matted cut junai grass, and we cleared off it in a hurry. The grass at the edge of the strip was about as high as our heads. We found a road ads followed it to a small village where we found Captain Patterson, his first sergeant, and several enlisted men. They had fixed up the native huts and were living in them. It was nearly noon, and we were hungry, so we sat down to eat some C rations and began to talk things over. We were given some canned pineapple which tasted pretty good. We learned that we landed at the smallest of four strips at Dobadurra. My Christmas dinner consisted of a can of meat and beans, some hard biscuit, and a couple slices of pineapple.